The first attempt to conceptualize climate as a system of data inputs and predictive outputs was through imagining a new kind of building. The amateur meteorologist Lewis Fry Richardson, while driving for a Friends’ Ambulance Unit attached to the French army during World War I—and after years of experiments with solving partial differential equations—conceptualized a building with a domed cap that had a map of the globe painted on its interior. 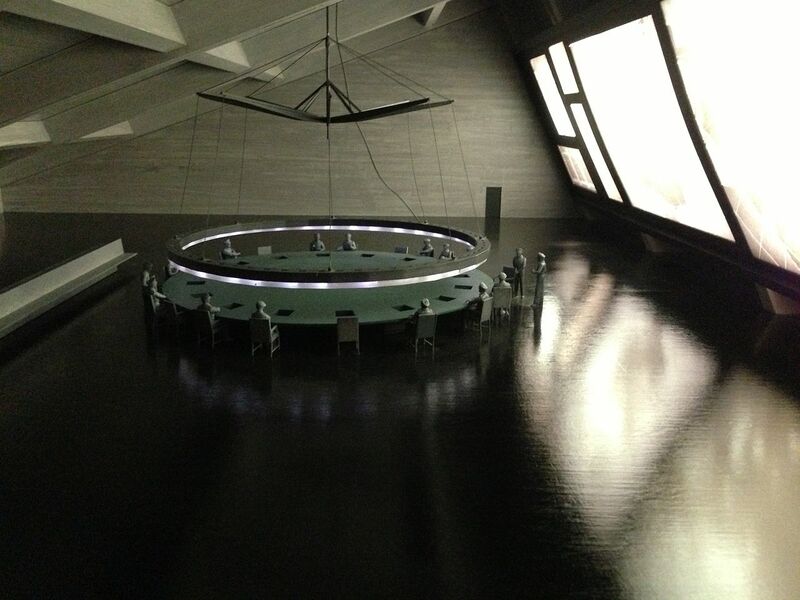 Below the dome, looking up at it and arranged in seating similar to that of theater boxes sat hundreds of “computers”—men and women, staring up at their specific quadrant. With data received through telex, Richardson’s hypothetical “computers” were able to calculate changes in wind, temperature, humidity, and other factors within their quadrant, and in dialogue with changes being observed and calculated by their neighbors. In Richardson’s fantasy, the strain of all this data was such that his “computers” would not be able to process the data any faster than changes in the weather were actually occurring—it was more of a rich record of the past than a prediction of the future. 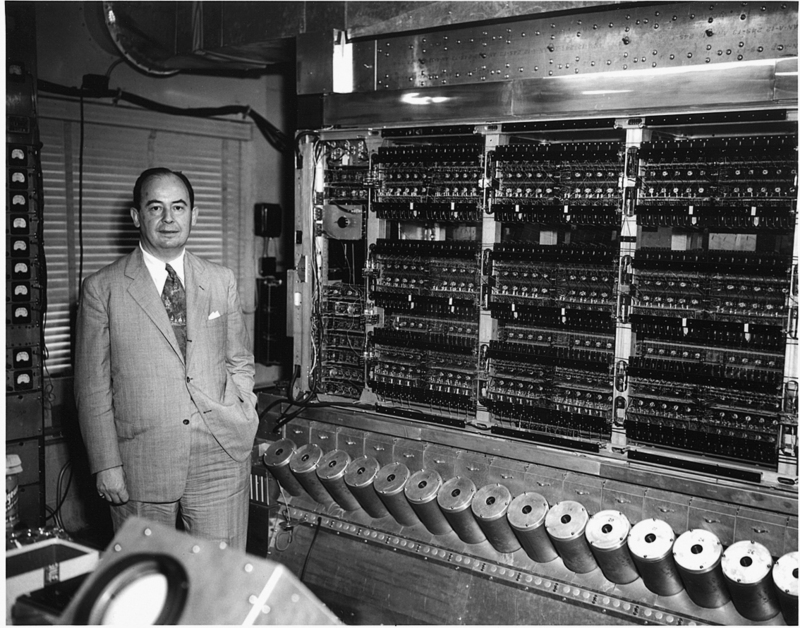 John von Neumann with the ENIAC computer, Princeton University Institute for Advanced Study, c. 1947. How (not) to experiment in a volatile, uncertain, complex and ambiguous world. to understand how a building would perform. 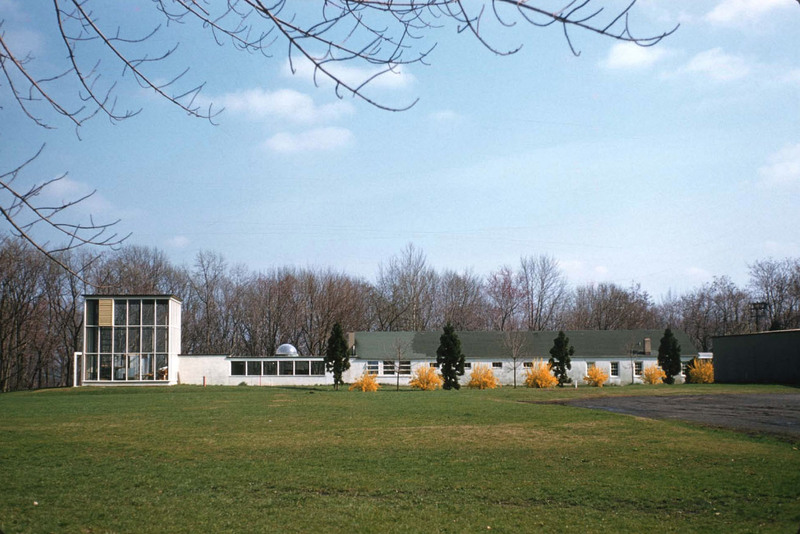 The Jean Labatut–designed Princeton Architectural Laboratory, consisting of an old stable building and a glass-framed addition. Note the glass dome in the center left of the image, where the Olgyays performed a number of their initial analyses. Photograph courtesy of Princeton University School of Architecture Archives, Jean Labatut Collection. At the Princeton Architectural Laboratory, these calculative attempts reached a zenith in the mid-1950s. Of interest here are the methodological studies and climate modeling devices of Victor and Aladar Olgyay. Hungarian architects trained as modernists before emigrating to the U.S. right after World War II, the Olgyays spent their professional career exploring methods for adjusting the architectural design process to better assess the relationship between a building and its climatic surrounding. They taught at MIT and Princeton. Their two books, Solar Control and Shading Devices (1957) and Design With Climate: A Bio-Climatic Approach to Architectural Regionalism (1963), entered into the curricula of architecture schools and sat on the reference shelves of design firms around the world well into the late 1970s. 5 In the immediate postwar period, before mechanical heating, ventilation and air conditioning systems became affordable and widely available, the Olgyays were the preeminent researchers into methods for using architectural means to place a building in its climate. Their major project at the Architectural Lab, funded by the National Science Foundation, was the design, construction, and testing of the Thermoheliodon device. It was intended as an improvement on the familiar heliodons. The Thermoheliodon was developed in order to make a significantly more detailed model of the climatic world available to the designer. It modeled the arc of the sun; it also had a set of fans behind an adjustable screen to account for wind direction. There was a shallow pit in the middle where soil from the building site was to be placed. Humidity was controlled by the jets. 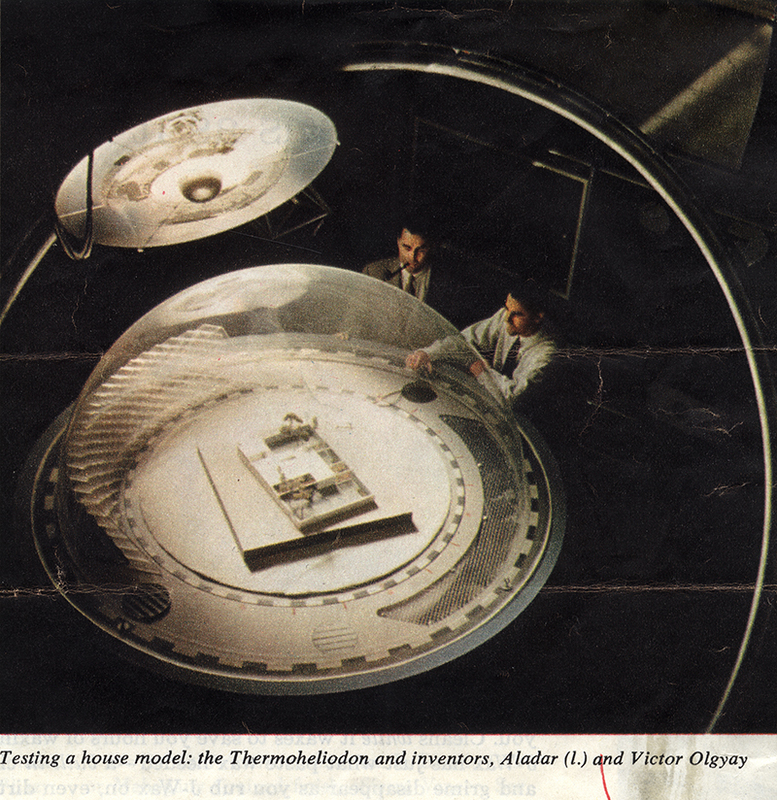 The Olgyay brothers with the Thermoheliodon device at the Princeton Architectural Laboratory. From Collier’s magazine, June 1956. A building model was constructed and placed in the center of the device and then subjected to a number of tests, based on a remarkable amount of data about a given building site. Much of the Olgyays’s work was in consulting, and the Thermoheliodon was used for their assessment of Josep Lluis Sert’s Peabody Terrace, Breuer’s UNESCO building, Gropius’s plans for the University of Baghdad, and many other projects; they also built a number of houses around Princeton. Long-term seasonal effects were explored, assisted by a number of movable trees. The device, along with the Olgyays’s well-developed climatic calculation method, led to a remarkably dynamic system of adaptive and efficient building. Intricate shading systems—louvers, eaves, trees, interior shades, the strategic placement experience of thermally active materials—from masonry to chemically active phase-change heat storage containers, and a very careful attention to the relationship between solar orientation, volumetric relations, and materials, characterized their method and the buildings they worked on. The Thermoheliodon was central. A problem had developed early on, however, that compromised the effectiveness of the device. The buildings the Olgyays inserted into the device were tested for shape and orientation, but the internal climatic conditions could not be adequately monitored because of the difficulty of scaling up the thermal capacity of materials—a small brick operates very differently, in thermal terms, than a large brick. The modeling of the radiation of stored heat was also difficult to model at scale. A significant portion of the grant report focused on their attempts to develop the right scaling formulas; it reads almost as an extended lament expressed in calculus—an implicit longing for a numerical method to predict a building’s performance. When seeking continued funding, they proposed to build identical test houses in Princeton, Montreal, and Los Angeles and to maintain constant data analysis of these test sites as a means to constantly adjust their calculative matrix according to the recent historical record. 6 Their funding was not renewed. Architecture and the 'Creative Economy.' after the war—architecture, they hoped, could produce a static, refined condition of climate balance so that the occupant, at home or at work, could best realize their human potential. In the plans and sections, and diagrams and charts, that they produced, the subject is central—literally, rendered in the middle of images intending to illustrate the challenges and benefits of a climatic architectural approach, and conceptually, as the image of the new ways of living that these architectures could allow. Research as a place apart.—not only an inhabitant safe from changes in the weather but also an architectural subject effectual enough to understand these intricate climatic relationships and develop the right formulas, the right methods, and construct a building accordingly. 8 Posed as well in their method is a static relationship between human and natural systems, an architectural aspect of the psychoanalyst Erich Fromm’s contemporaneous proposal for a “Science of Man,” a set of applied principles that would lead to a stable condition between the anxieties of society and the bounty of nature, a relationship rendered static through the intervention of a well-considered architecture. 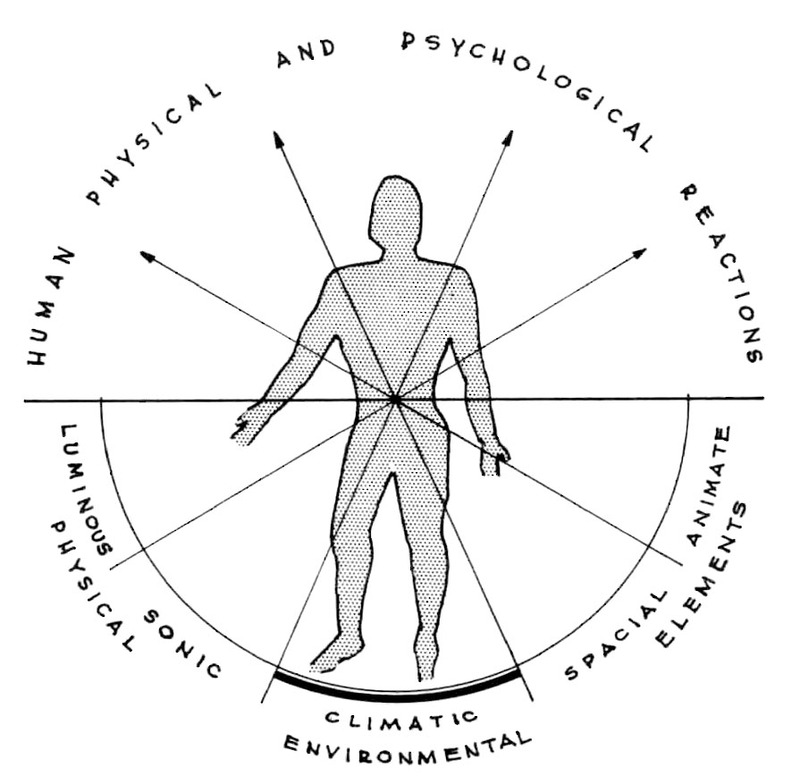 Victor Olgyay, “Man as the Central Measure” from Design With Climate, 1963. These diagrams suggest that the transformation from calculation to computation—from the engagement of human knowledge as formula to the processing of data through scripts and algorithms—was a complicated one, with strains and anxieties that resonate across a broader spectrum of analysis and inquiry. In climatology, ecology, and other emerging fields of environmental analysis, conceptions of a human-centered world, and of balance and harmony more generally, were being upended and updated. Which is to say, if the building was going to produce a static comfort zone, it was to be through a conflict, rather than a collaboration, with the natural forces that surrounded it—forces that were increasingly understood as chaotic, unpredictable, and contingent.chaotic, unpredictable, and contingent. An op-ed on the wickedness of application. 9 At stake, more than a specific set of design or material variables, were the continued relevance of the modern subject as the object of architectural intervention and as the agent of historical change. It was precisely this conception of the human that would lead to a counter-theory of the disappearance of the human in the period, perhaps most aggressively in the philosophical discussions spurred by Louis Althusser and his insistence that “Man is an irrational, derisive, hollow notion…a vain, empty discourse that is in essence the diversionary tactic of a reactionary ideology.” 10 Pretty definitive. How (not) to experiment in a volatile, uncertain, complex and ambiguous world., processing units to clarify and render actionable—possibly through new architectures—our increasingly specific knowledge about the changing climate. Daniel A. Barber is an Assistant Professor at the University of Pennsylvania, where he teaches the history of modern architecture. His research explores relationships between design fields and the emergence of global environmental culture during the 20th century. 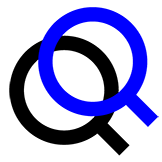 Articles have recently been published in Grey Room and Technology and Culture.